Amidst a maze of wooden shipping crates, faux pine tree branches, and the buzzing of power tools, a series of mysterious black walls arise from the center of Stage 29 on the Universal Studios front lot. Many films have called Stage 29 “home” at some point in cinema history, including To Kill a Mockingbird (1962), Man on the Moon (1999), and Indiana Jones and the Kingdom of the Crystal Skull (2008). The set that’s currently under construction on this historic soundstage, though, is not for anything you’re ever going to see on the big screen or on your television screen at home. This fall marks the first time in the history of Universal’s signature scream fest, Halloween Horror Nights, when the event’s creative team has taken over a main soundstage as the setting for one of its notoriously horrifying mazes. It’s only fitting that it should be for a brand new haunted attraction that’s sure to be this year’s most screamingly popular. Starting Friday, September 14, guests at Halloween Horror Nights will be able to step inside an impeccably accurate recreation of the world (and netherworld) from Netflix’s pop-culture phenomenon, Stranger Things. The storyline of the Stranger Things maze sticks closely to the series’ first season in which Hawkins Middle School student, Will Byers, is mysteriously abducted and entrapped in a dark, monstrous underworld called the Upside Down. Along with Will’s friends Mike, Dustin, and Lucas, whose voices will be heard coming from their trusty walkie-talkies throughout the maze, you’ll descend into to the Upside Down via state-of-the-art computer animation, projections, and ethereal fiber optic lighting techniques. Other series regulars including Eleven, Sheriff Jim Hopper, Joyce Byers, Nancy, Dr. Brennan, and Barb will make appearances, too. Make sure to keep a lookout because around every dark corner the show’s toothy monster-humanoid, the Demogorgon, will be waiting to sink its fangs into you while transitioning between the show’s familiar settings like the Byers house, the government-run Hawkins Lab, Hawkins Middle School, the Void, and Will’s personal hideaway, Castle Byers. 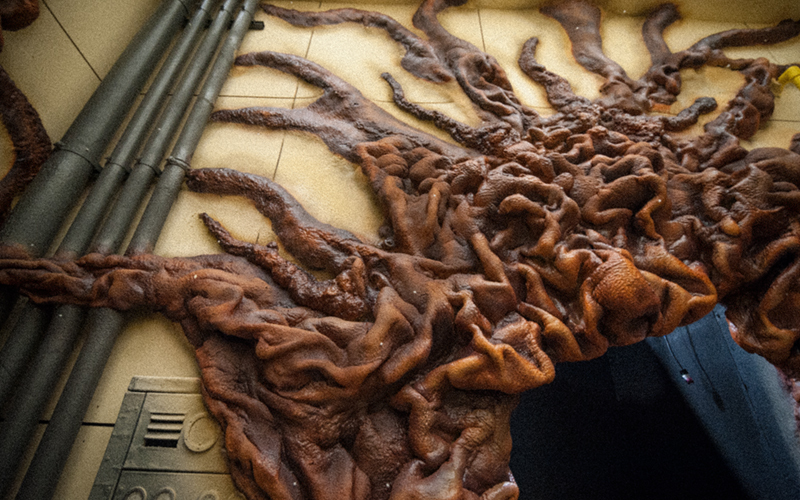 Murdy and his team were able to painstakingly create the maze by working with Stranger Things’ creature designers, referencing behind-the-scenes production photos, and using actual production designs from the series. “It’s a period piece,” Murdy says of the show’s ‘80s aesthetic. 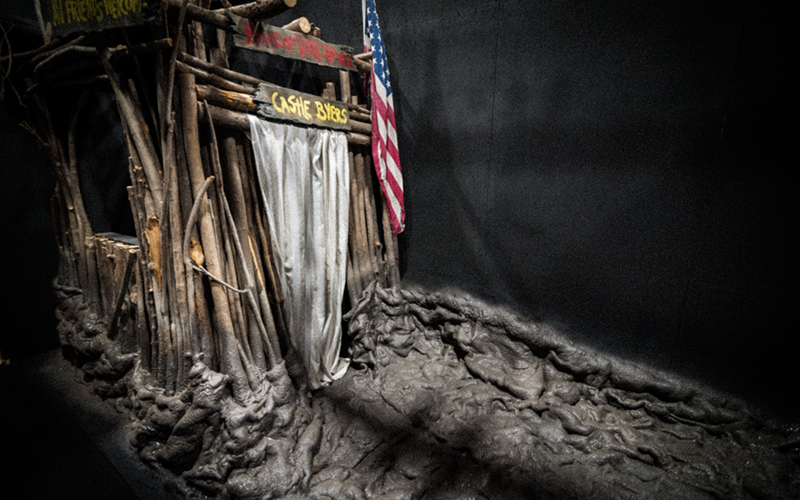 “That means all the props, and set décor, and wallpaper, and everything—we have to match the show exactly.” If particular components of set dressing couldn’t be found in the Halloween Horror Nights warehouse, which Murdy says holds thousands upon thousands of catalogued items from previous years’ haunts, the props and set dressing crews were sent to scour flea markets and yard sales for the perfect period pieces. As an example, Murdy points out a bright orange patio chair on the porch of the Byers house that he humorously refers to as an “ugly monstrosity from the 1970s,” adding that it almost exactly matches one seen in the show. “Even though it takes place in the ‘80s, the implication is that [the Byers] don’t have a lot of money so most of the décor in the house…is coming from the ‘70s,” says Murdy. 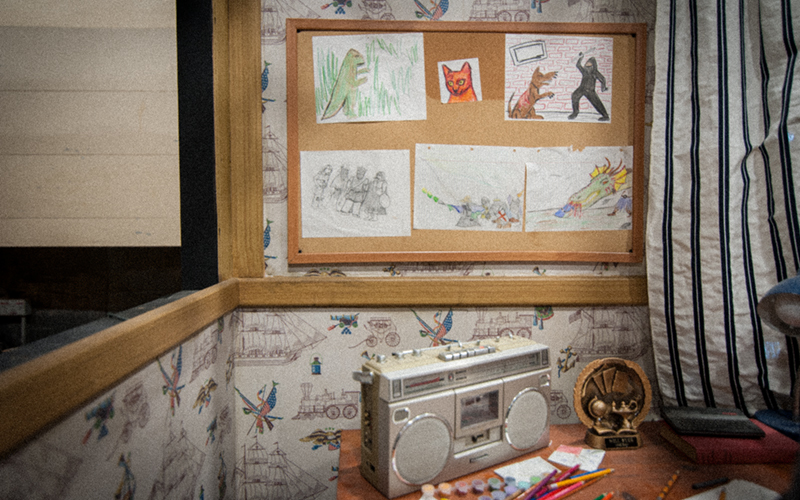 In a few cases, the wallpaper is an exact match to patterns seen on the show. Stranger Things fanatics will also be sure to find Easter eggs buried in the depth and horror of the maze while selections from Stranger Things’ hypnotic synth-pop score pervade their senses. 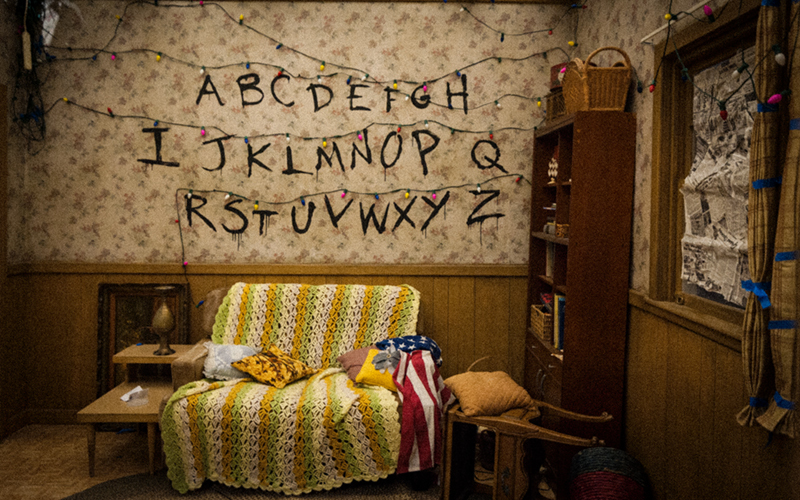 Beyond the soundstage and beyond the maze’s vivid interpretation of the series, the Stranger Things attraction is a new challenge for Halloween Horror Nights simply because the Netflix show is not pure horror, as Murdy attests. He says, “There are elements in the show that are very horrific and there are elements that are pure sci-fi or pure fantasy.” Unlike some of the classic horror franchises Halloween Horror Nights has tackled before—A Nightmare on Elm Street and The Texas Chainsaw Massacre, for instance—the backbone of Stranger Things is friendship, love, and humor. But rest assured Halloween Horror Nights devotees and October adrenaline junkies: The gateway to the Upside Down has opened and the Demogorgon is taking you back in. Halloween Horror Nights runs from Sept. 14-November 3. Next articleWhere to Get the Best Milkshakes in L.A.